This book introduces a modern approach to embedded system design, presenting software design and hardware design in a unified manner. It covers trends and challenges, introduces the design and use of single-purpose processors ("hardware") and general-purpose processors ("software"), describes memories and buses, illustrates hardware/software tradeoffs using a digital camera example, and discusses advanced computation models, controls systems, chip technologies, and modern design tools. For courses found in EE, CS and other engineering departments. Frank Vahid is the author of Embedded System Design: A Unified Hardware/Software Introduction, published by Wiley. 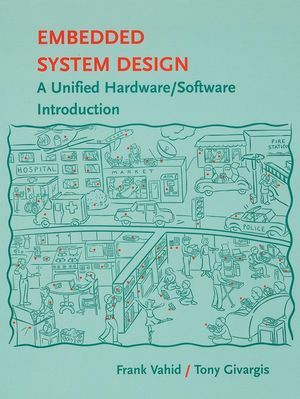 Tony D. Givargis is the author of Embedded System Design: A Unified Hardware/Software Introduction, published by Wiley. State Machine and Concurrent Process Models. Embedded Systems Design: A Unified Hardware/Software Introduction provides readers a unified view of hardware design and software design. This view enables readers to build modern embedded systems having both hardware and software. Chapter 7's example uses the methods described earlier in the book to build a combined hardware/software system that meets performance constraints while minimizing costs. Not specific to any one microprocessor. The reader maintains an open view towards all microprocessors. Chapter 3 talks of features common to most microprocessors. Provides a simple, yet powerful, new view of hardware design, showing that hardware can be automatically generated from a high-level programming language. Presents unified view of hardware and software; both are described using a programming language, both get derived from that language, only differing in design metrics. Chapter 2 concisely provides a method for deriving hardware implementations of sequential programs  something not found in any other book.